A week ago I published a first showcase, explaining how to replicate the hotspot workflow for VR projects on a 2D image. This second article about using hotspots for a 2D image is not duplicating as closely that same feature: instead of showing the popups for a duration defined by the developer, this workflow will offer a close button for the popups. The learner decides when to close a popup and proceed (eventually) to the next hotspot. I also used a technique, often labeled as 'lightbox': to have the popup stand out of the rest of the content, it will have a semi-transparent cover in the background dimming the rest of the slide. I used the same image (welcome screen) and content for the popups as i the first workflow. Only some small color changes and changes in the location have been applied . Watch this 3-slide movie: after the title slide (doubles as poster image) you can test the new hotspot slide, and the last slide gives a short Step-by-step list if you want to use this slide in your project. 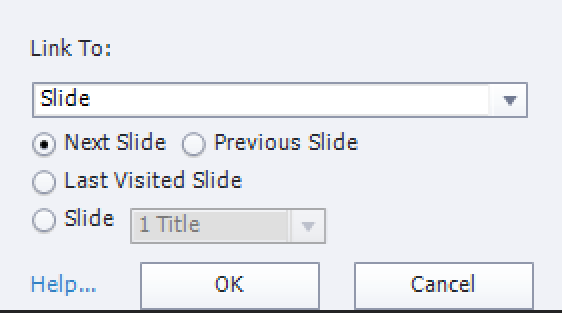 Copy the hotspot slide from the sample project and paste it into your project. The object names will get an extra number, but you don't have to bother about that. The advanced and shared action is automatically adapting to the new names. Select the Image.. 'WelcomeScreen.png' and replace it by your image (Properties panel). Move eventually the hotspots to the right location. If you need less than 6 hotspots you can hide some of them in output. Deleting is also possible. Start by hiding or deleting the last hotspot(s). The sequence of the hotspots is starting with HS_Responsive (first in first row), going to the right and then to the second row. Last hotspot is for the PPT. Open the multistate object SS_Info.. which is just on top of the 'Cover' (needs to be there). 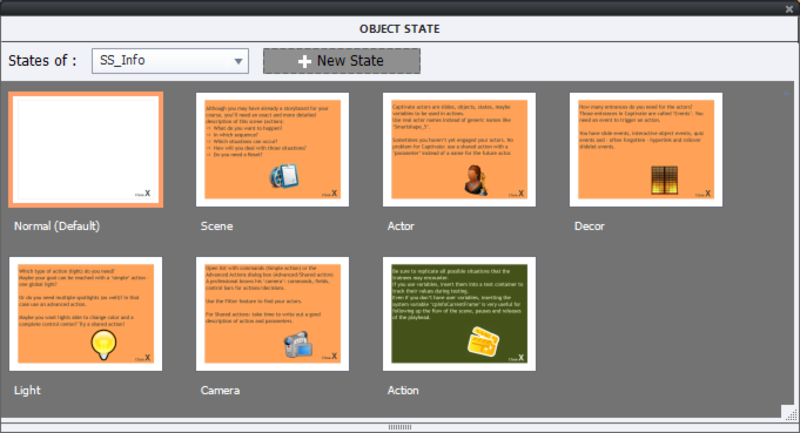 Click the State view button in the Properties panel to open the Object State panel. Leave the Normal state alone. Replace the content in the other states by your content (follow the sequence described under 4.) You don't need to rename the states, nor to delete the last unused ones (just leave them as they are). Start testing with 'Preview HTML in Browser' (F11). A while ago I published a list with events able to trigger an action, whether it is a simple, advanced or shared action. Most commonly used events are the slide events, Success/Failure events for interactive objects, Question slide and Quiz events, D&D events. Both the hybrid rollover slidelet events (now deprecated because it is not supported for HTML output) and the Hyperlinks are 'outsiders' but can be very useful as I want to point out with this article (Closing popup or lightbox) and the next article (creating a dropdown list with Jump to actions, equivalent of the former 'Goto Slide' widget). The title slide has a text hyperlink 'Next' to proceed to the next slide. The second slide has six shape buttons, each opening a popup (it could have been a lightbox as well, work flow is identical). In the popup information you'll find the text 'Close X' which is a hyperlink to close the popup. The 'Normal', or default state looks invisible: there is no text in the text container with the exception of the text hyperlink 'Close X'. This was achieved by giving the text hyperlink the color of the background, the text container a Fill with Alpha=0% and no stroke. The other states have a Fill (Alpha=100%), they have information text with a visible color (also for the Text Hyperlink) and an image. Look at the timeline of the second slide: all shape buttons (name starts with SB_) pause the slide at the same time, 15,5 secs. When triggering an action, the playhead should not be released, to allow clicking as many times as wanted, in any sequence on those shape buttons. The number of attempts is left at Infinite. you can use a one-line shared action with two parameters (text container and state). Another difference for hyperlink events: the command Excecute Shared Action is missing. That is too bad, because if it had been available, one shared action would have been able to achieve both showing popup (with the 6 shape buttons) and close the popup (with the Hyperlink). There is no way to prevent the playhead from being released if you trigger a simple action; use a standard advanced action. You cannot trigger a shared action with a hyperlink. Some commands have a different look: example is the Slide command (see screenhot in this article).